In the Teacher Research Collaborative (TRC), we have focused on learning how to foster more-effective teaching and more-equitable results for students. 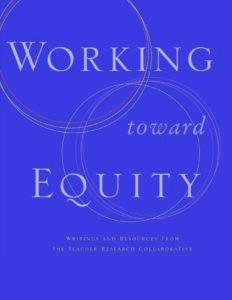 As educators who are concerned about the inequities in our schools, we see inquiry—defined loosely as a process through which teachers study their own practice in order to change and strengthen their teaching—as a valuable tool that can support teachers in becoming more equitable educators and thus can contribute to more equitable achievement for students. Why have we in the TRC come to see inquiry as particularly well suited to address these challenges? Because inquiry can help teachers to spiral deeply into the most difficult dilemmas they face—to ask questions, to face the discomfort of not knowing the answers to those questions, and then to find ways to move forward to address them. Inquiry can interrupt the ways in which our beliefs and practices may unwittingly contribute to the “patterned” failure of many of our students—that is, failure that correlates with racial, ethnic, or socioeconomic background. Ultimately, inquiry can build a sense of efficacy, helping teachers believe, I can help move this child forward; I can learn how to succeed with the students I’ve found it most difficult to reach.